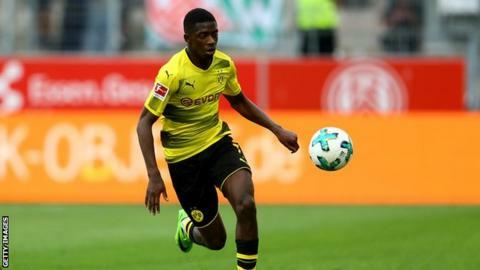 Barcelona have agreed a deal to sign Borussia Dortmund forward Ousmane Dembele for a fee that could rise to 147m euros (£135.5m), making him the world's second most expensive player. The deal is eclipsed only by Neymar's recent £200m move to Paris St-Germain. Barca revealed that his deal will contain a release clause of 400m euros. With regard to the fee now agreed, Dortmund said in a statement that the payment of add-ons "was agreed up to a maximum total amount of approximately 40% of the fixed transfer fee". Barca have failed with three bids for Liverpool midfielder Philippe Coutinho, with their most recent offer of £114m turned down last Friday. Luis Suarez's transfer from Liverpool in 2014 is officially their most expensive purchase, at £75m. However, Barca president Josep Maria Bartomeu has previously that said "the overall cost of the operation" to sign Neymar from Brazilian club Santos in 2013 was "over 100m euros (£92m)", despite the transfer fee having been disclosed as £48.6m. Of course the transfer fee is astonishing but former team-mates and former coaches will tell you that Ousmane Dembele has the potential to be a Ballon d'Or winner. They mention his extraordinary acceleration on the ball, they rave about how two-footed he is (his right foot is supposed to be stronger than his left but it's very close) and they talk about his extraordinary skills, touch and close control. His former manager at Rennes, Rolland Courbis, actually claims that Dembele could have joined Barcelona last summer but turned them down. He says they offered more money than Borussia Dortmund but the French youngster chose to go to Germany.